Try these boredom-busting variations on traditional exercises with our one-stop, full-body workout. On days when the gym is absolutely packed, open machine can be tough to come by. Sure, you could work in, but trading set after set with strangers—your pace frequently dictated by theirs—is rarely the best recipe for cooking up more muscle. We have a solution. With a little imagination, you can train every bodypart on one piece of equipment: a Smith machine. Although free weights multiply mass the fastest by enlisting muscle for balance, the restrictions of the Smith machine are also its greatest strengths. Unlike a free barbell, a Smith bar is perpetually level and its safety catches allow you to easily bail out if the weight becomes too heavy. Put simply, you can focus on the up and down and ignore the rest. Whether it’s your lifeline in a crowded gym or just another training tool, the Smith machine can both approximate some free-weight lifts, such as chest presses and bent-over rows, and bring a unique twist to others, like biceps curls and standing calf raises. In this guide, you’ll learn how to best perform the most common Smith exercises as well as some you’ve probably never tried before. There’s at least one move for every major bodypart. 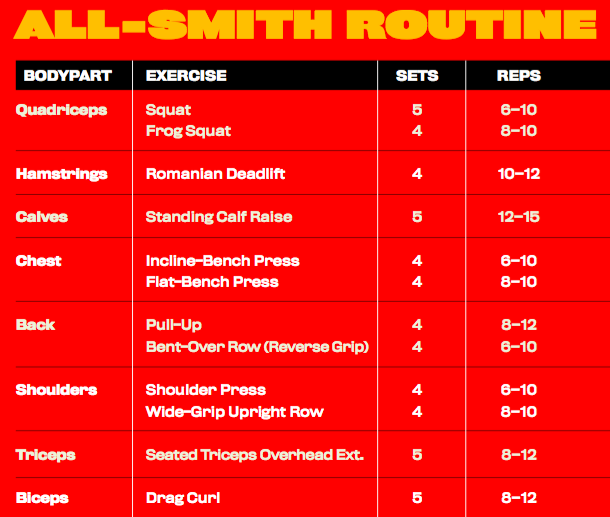 Slot them into your regular routines or try our all-Smith workout below. Just beware of singing the Smith machine’s praises too loudly, or it may become the epicenter of future gym traffic jams. The Smith machine makes it easy to stay upright throughout a squat so you work predominantly your quads. You can even maintain balance in positions impossible to duplicate with free weights. Stand with your feet about 10 inches in front of the bar, your heels roughly 20 inches apart and your toes pointed out 45 degrees. Descend until your thighs are just below parallel. Pause and push the weight back up. The main difference between these calf raises and those done on a calf machine is that the resistance is directly over your calves rather than transferred through a lever. You need less weight and will probably find balancing more difficult, which forces your calves to work harder. Stand with just your toes on a block that’s approximately 4 inches high. Concentrate on a maximum heels-down stretch and toes-up contraction on each rep. Performing squats with your feet more than 10 inches in front of the bar better targets your hamstrings. You can also do romanian deadlifts, which focus on your hams, glutes and lower back. To get a proper stretch when doing romanian deadlifts, stand on a block or bench that’s no more than 6 inches lower than the stop on a Smith machine. Stand where the bar will be about 2 inches in front of your legs throughout the lift. To keep continuous tension on your hams, stop just short of standing straight at the top, and never bounce the bar off the springs at the bottom. The following two moves focus on the front and middle deltoids, but you can hit the rear delts with wide-grip bent-over rows and the trapezius via shrugs. Try to use a Smith machine with perpendicular guide rods. Use a bench seat that tilts down a few degrees. Don’t bend your wrists backward when unlocking the bar, which can pull your elbows forward during lifts. To keep continuous tension on your front delts, lower the bar to approximately chin level and stop just short of lockout. Grip the bar with your hands shoulder-width apart or wider. As you pull the bar up, bring your elbows directly out to your sides and keep the bar close to your body. This focuses more on your middle deltoids and less on your trapezius than a narrow-grip upright row. Unless you’ve done some close-grip benching, odds are you’ve never worked triceps on the Smith machine. During free-weight triceps extensions and cable pressdowns, your hands travel through semicircular arcs that cannot be fully duplicated on Mr. Smith. But the uniqueness of doing triceps extensions locked into a straight plane is what makes them effective as an occasional addition to your routine. Choose a lighter weight than you would for free-weight extensions. While seated beneath the bar, unlock it using an underhand grip with your thumbs 8 inches apart. Bend your elbows and let them move forward, lowering the bar to just behind your head. Extend your arms, allowing your elbows to come back to the start position. Stop just short of lockout at the top. Note: This exercise can stress your wrists, so don’t include it in every arm workout. Like your triceps, you usually work your biceps through a semicircular plane, so training them on a straight plane can be a welcome change. Instead of your hands moving forward and up while your elbows stay steady as in a traditional curl, your hands move straight up while your elbows move back and up. Grasp the bar with a shoulder-width, underhand grip, your fingers curled up slightly. As your elbows move back and your hands come up, your fingers are tugged down. Resist the urge to either shrug your shoulders or bring your elbows forward as you near the top. The range of motion is slightly shorter than a barbell curl, and most of the stress occurs during the middle portion of the move. This lift can also be a wrist-wrencher if overused, so include it only occasionally.